SAN DIEGO (BRAIN) — 100% on Thursday introduced a new collection of Peter Sagan Limited Edition sunglasses, which will debut this Saturday at the Tour de France. IRVINE, Calif. (BRAIN) — Watteam has updated its Powerbeat power meter, introduced last year. Among the new features: a $600 kit that lets consumers easily switch a powermeter between two bikes. With Eurobike and the Tour de France coming up, expect a flow of new product introductions this week. 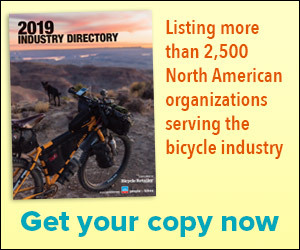 LONGMONT, Colo. (BRAIN) — Early July this year is prime season for new product introductions, when even buttoned-down trade sites have an excuse to feature photos of pro riders in scenic locations. FRIEDRICHSHAFEN, Germany (BRAIN) — Racer, a French glove and protection manufacturer, plans to introduce a battery-powered heated shoe cover for cyclists at Eurobike, which opens here on Sunday, July 8. Racer has offered heated gloves for cyclists for several seasons. LAGUNA, Calif. (BRAIN) — Crankbrothers is offering limited edition red, white, and blue versions of its Candy 7, Mallet E LS, and Stamp 7 pedals this month. The USA Collection pedals are being sold through the company's website and via dealers. MORGAN HILL, Calif. (BRAIN) — LEM, a brand that started in Italy in 1972 making motorcycle helmets, has launched a line of bicycle helmets in North America, with launches planned for the EU and Asia soon. SANDY, Utah (BRAIN) — Reynolds has streamlined its carbon wheel line for 2019, offering good/better/best options in road, gravel and mountain, plus a new selection of e-MTB wheels. The company’s reps will begin rolling out the program in July, and Reynolds will debut the line at Eurobike. GRENCHEN, Switzerland (BRAIN) — BMC's new Alpenchallenge AMP Cross is a lightweight e-bike built for off-pavement adventures. TORONTO (BRAIN) — 3T is now offering its frames in a ready-to-paint finish for those who want to use the custom painter of their choice. The first ever RTP 3T frame was an Exploro model, painted by the legendary Italian bike designer, manufacturer, and painter Dario Pegoretti. SANTA CRUZ, Calif. (BRAIN) — Gazelle Bikes has launched the CityZen T10 Speed in the U.S. The bikes features a Bosch Performance Speed mid-mount electric motor and 500Wh in-tube battery. It offers up to an 85-mile range. OCEANSIDE, Calif. (BRAIN) — Floyd's of Leadville chose the Race Across America team start here on Saturday to launch its new CBD Recovery Protein Powder, which contsins 25 milligrams of cannabidiol (CBD), a legal anti-inflammatory extract from the cannabis plant. CHICAGO (BRAIN) — SRAM's new NX Eagle offers a 1x12 speed offroad drivetrain for about $375 for the group. The group shares many features with SRAM's XX1, X01 and GX drivetrains. Notably, its 11-50 tooth cassette works with Shimano-type cassette bodies. OBERWANGEN, Switzerland (BRAIN) — Stromer said its new top model, the ST5, offers new integrated features, class-leading power and exceptional battery life. ASHEVILLE, N.C. (BRAIN) — Industry Nine is offering four wheelsets in its new Torch Road Alloy product line. The TRA wheels offer features, including custom color options, previously available only on the brand's Torch Mountain wheels. WRAYSBURY, U.K. (BRAIN) — ShredMate, a bike computer that tracks mountain bikers' jump air time and g-forces, among other factors, has shipped all orders to its Kickstarter backers and is now available for purchase in bike shops and direct. ASHEVILLE, N.C. (BRAIN) — Cane Creek Cycling Components is making a limited edition of its HELM 27.5 fork in a “Cherry Bomb” color scheme. STABIO, Switzerland (BRAIN) — Assos will launch a new XC clothing collection for male and female mountain bikers this summer. The company developed the new collection with help from the BMC MTB Racing Team. NEVERS, France (BRAIN) — Look and SRM collaborated on the development of the new EXAKT power meter pedal, which will be available next month. ALISO VIEJO, Calif. (BRAIN) — Continental said it has redesigned its King Series line of mountain bike tires from the inside out.